What do you do when your mum, your dad and sixteen camels are in trouble - and only you can save them? The sometimes sad but mostly funny story of a boy, a girl and four trillion dollars. Oliver's parents both work long hours at an investment bank and are so busy making money that they hardly have any time for him. Oliver isn't worried about having all the latest gadgets that money can buy though, he would just like them to spend time together as a family and he would really like a pet dog. He spends his time watching a dog through a pet shop window trying to come up with ways to convince his parents to let him bring the dog home. When a lady buys the dog and threatens to harm him if Oliver doesn't get his parents to return the money she invested with them he doesn't think things can get much worse. Until he discovers that there is a problem with the bank and he realises the money has been lost. Can he find a way to repay the lady and save the dog? I really enjoyed Morris Gleitzman's last book Grace so was looking forward to reading Too Small To Fail. I'm pleased to say that the story doesn't disappoint and I enjoyed it just as much. 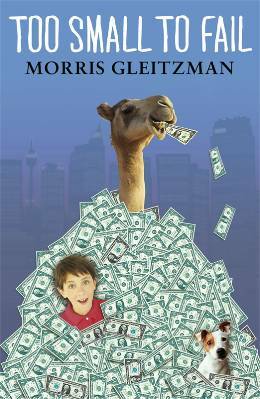 Morris Gleitzman has a way of writing that will capture the attention of younger readers, he writes about current events in a humorous and light way but still manages to offer a lot of insight into the financial crisis. I loved the way he manages to talk about investment banking in a way that will make sense to even the youngest readers and I think even adults can learn something from the story. Oliver is a lovely main character, he is young and in some ways naive but he is sweet, loves his family and has a strong sense of right and wrong. He may be hopeless at maths and come up with some crazy money making schemes but he is trying to correct his parents mistakes. The story is hilarious, partly due to the things that Oliver gets up to but also with thanks to the antics of the dog Bailey and Moo the camel, I actually laughed out loud several times when I was reading it. Like Grace, Too Small To Fail is a relatively short book and one that it is easy to read in one sitting. It is a fun story with a serious edge to it and a strong moral undertone. I definitely need to start working my way through the rest of Morris Gleitzman's back list and am looking forward to seeing what he comes up with next.